I urge you to make time to visit St Patrick's Church during your Anglesey holiday. While its exterior is that of a simple rural church, it is on the inside that you'll discover a very pleasant surprise. 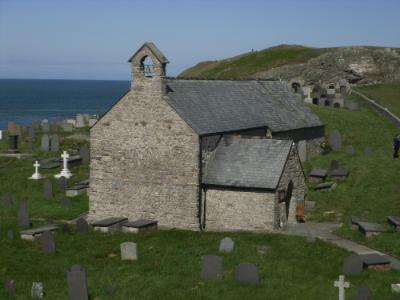 Like almost all of Anglesey’s ancient churches, the Church of Llanbadrig, on the headland near Cemaes Bay was founded during the 5th Century. St Patrick had no specific business here on Anglesey and it is by serendipitous tragedy that he found himself here in the first place. Bishop Patrick, as he was then titled, was on his way to Ireland to bring the heathens there to Christianity on the strict instructions of Pope Celestine. Travelling by ship from visiting St Columba on the Scottish island of Iona during AD440 - bound for Ireland - his ship was savaged by one of the typical violent Anglesey storms that regularly sweep up and down the coastline. If you had the technology to hand you’d discover that shipwrecks were all too common occurrences. 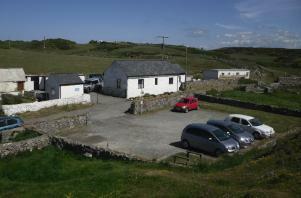 (Swtan Cottage was partly constructed with remains of a shipwreck). 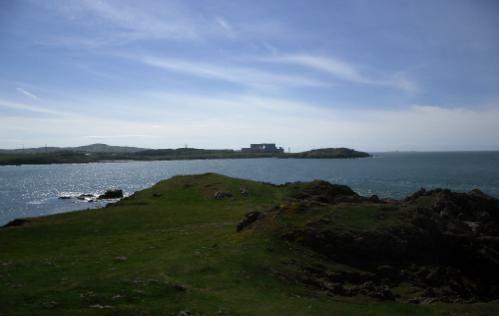 So the tale goes, the Bishop found himself marooned on Middle Mouse - now called Ynys Badrig (St Patrick’s Island) - which lies right off the Llanbadrig headland. How he made his way from there to dry land is not mentioned, nor whether there were any other survivors. However, Patrick did eventually make safe landfall and found sanctuary in a cave that lies in the cliffs to the left (looking out) and below. Here he found a fresh water source which sustained him during his recovery. The cave is called, Ogof Padrig (Patrick’s Cave) and Ffynnon Padrig (Patrick’s Well). As an expression of his heartfelt gratitude to God for his rescue, Patrick established the original church. Be aware that the way down to the Cave is DANGEROUS and it's a mean type of rock and slippery. Also, you get a pretty vicious sea swell. BE CAREFUL! First of all, Llanbadrig Church has a very plain and robust exterior, however, please allow yourself to be drawn inside. There you can appreciate an interior that is both simple and beautifully intriguing. 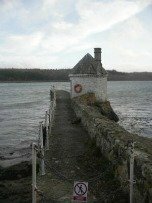 There would have been a chapel in one form or other at Llanbadrig since AD440, though the weather along this frequently tempestuous coastline and the Second Law of Thermodynamics would have rendered most of Man’s endeavours to rust and moth by now. Even the present day Church of Llanbadrig will eventually dissolve in the face of Time. Maybe, the Spiritual will persevere beyond the Temporal. As I write above, the original church was established around AD440 and would have been a basic structure, probably of wattle and daub, for local people to congregate in hopeful prayer on this once desolate corner of Anglesey. It is believed that like Llanbabo Church and many Anglesey churches, the first stonework was probably laid down around the 12th Century. You’ll find that the earliest stonework is the top of the font. Various significant additions were made during the 14th & 16th Centuries, when the church would most likely have been extended to its present form. 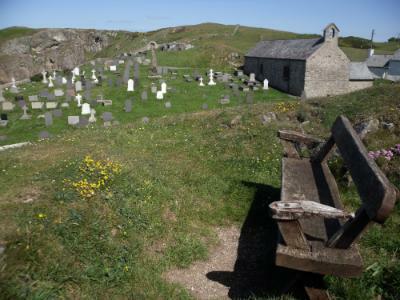 During the middle to late part of the 19th Century St Patrick’s Church was renovated to the building that today rests right on the cliff at Llanbadrig, Cemaes. It was the later renovation of 1884 that introduced the unexpected Eastern character to the altar, the windows and iconographic representation beside the window. But why the Arabic, Moslem style fine, decorative tiling? It was at the behest of the 3rd Lord Stanley of Alderly - and his money – that church discovered a Moslem association. The Noble Lord fell in love and married a Spanish lady called Fabia Santiago, who was of the Moslem faith. You’ll remember that the Moors once dominated the south of Spain and their mark remains in the architecture. Therefore, Lord Stanley, who had converted to his wife’s faith, insisted that this be reflected tastefully in the renovation works carried out. This is the beautiful blueness that immediately draws your eyes to the Altar and the windows. One thought intrigues me, though. The Koran precludes figurative representation but the iconographic representation of the Pastor Bonus (Good Pastor) bearing the Lamb must be an assumed accommodation. 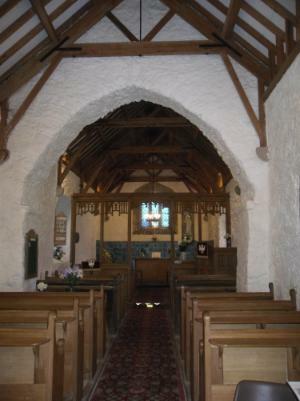 Cemaes Bay grew in population and the people must have demonstrated sufficient reluctance to venture in all weathers in Llanbadrig that a second Church was constructed in the village. 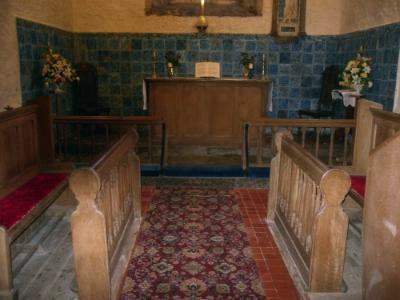 By the 1980s the church had fallen into disrepair because of continued lack of use. Local people undertook a major project to renovate yet again in 1985. However, their work seemed to be for naught because on June 1st 1985 St Patrick’s Church suffered from an arson attack which destroyed all the recent endeavour, enthusiasm and hard work. Disheartened but not humbled, the same group once again set about the task and the church was re-opened on May 24th 1987 at a cost of some £15,000. These people must surely have accrued benefits in Heaven for not succumbing to despair and denying the challenge laid out for them. 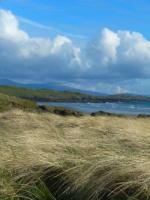 A visit to Anglesey at any time of the year and in all weather can be a treat. Yet, indulge yourself in a degree of patience and research and visit in fine weather when the tide is high. 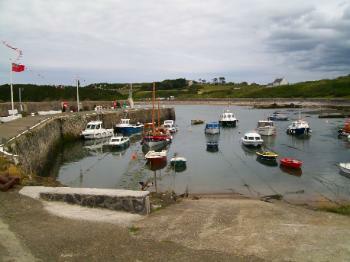 Cemaes Bay is absolutely delightful picture postcard seaside village with beaches and ice-cream opportunities. Spend your day on the beach and then indulge in fine dining in the village or even head out for Church Bay and the Lobster Pot Restaurant. If you’re not inclined by nature to park yourself on a beach all day, then just head along the cliff paths in either direction, West or East. This is the now famous Anglesey Coastal Path. You will discover such unique and unexpected Peace and Beauty after no more than a ten minute walk. My favourite walk is to the East, in the general direction of Bull Bay. It is an up and down kind of trot, as expected on a cliff walk but you will encounter unexpected places. I won’t tell you what you’ll find because I came across them by pleasurable serendipitous accident. First of all, you need to get yourself to Cemaes Bay. 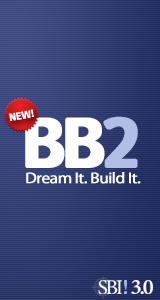 There’s a link at the bottom of this page that’ll help you achieve that important end. Why not pop into then shops or have a meal before you head off for Llanbadrig and St Patrick’s Church? From the village is pretty straight forward. Follow this little lumpy-bumpy, tortuous route around and past the hotel. Ahead there’ll be a little old sign that will direct you to the 5th Century Church, where you’ll find the little car park above right beside St Patrick's Church. 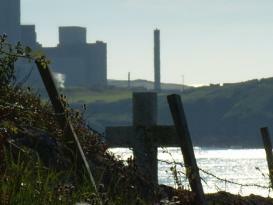 Return from St Patricks Church to WHY ANGLESEY? Page.